This is the first in a series of briefs focusing on alignment of country efforts under the 2030 Agenda for Sustainable Development, the Paris Agreement and the Sendai Framework for Disaster Risk Reduction. This initial brief provides an introduction to the concept of alignment as it relates to these policy processes. Recent years have seen a number of global commitments aimed at putting human development on a more sustainable pathway. There is broad agreement that climate change represents a threat to sustainable development; consequently, development efforts must be resilient to the impacts of climate change and related disaster risks in order to be sustainable. 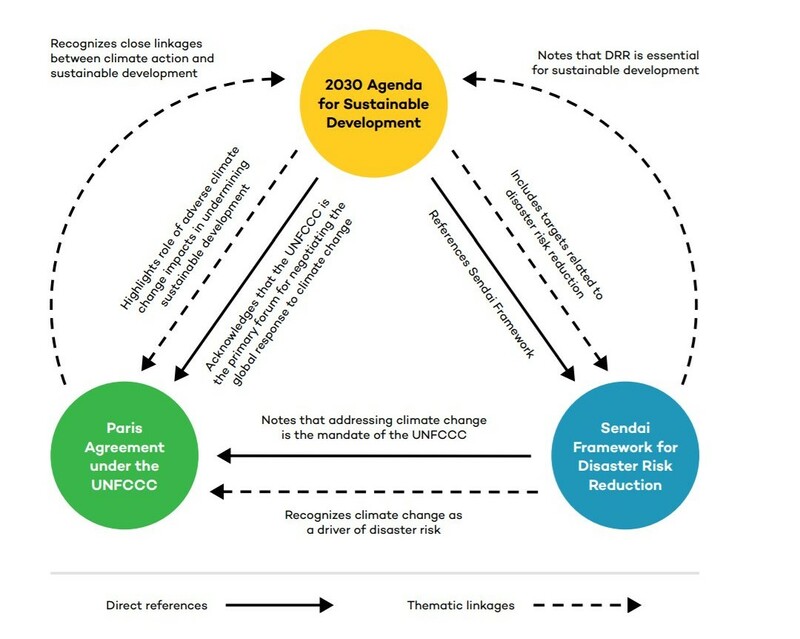 This has been recognized in international agendas, including the 2030 Agenda for Sustainable Development, which established the Sustainable Development Goals (SDGs); the Paris Agreement under the United Nations Framework Convention on Climate Change (UNFCCC); and the Sendai Framework for Disaster Risk Reduction (DRR); all of which have drawn links between climate change adaptation, DRR and efforts to achieve sustainable development. Within countries, a number of policy processes have been established under these global agendas, elaborating individual commitments, strategies and plans for meeting the objectives therein. These include strategies aimed at achieving the SDGs; National Adaptation Plans (NAPs) and Nationally Determined Contributions (NDCs) under the Paris Agreement; and DRR strategies under the Sendai Framework. These represent key national policy processes that can advance climate-resilient development by facilitating systematic consideration of climate change in decision-making. Alignment of these different processes can increase coherence, efficiency and effectiveness towards development outcomes that are resilient and sustainable. There is increasing focus on the issue of alignment in international dialogues, including discussions under the UNFCCC (2017) and the United Nations Office for Disaster Risk Reduction (2015a). Many countries recognize the value of aligning relevant policy processes; however, they struggle to understand what it looks like in practice and how it can be achieved. This introductory brief aims to increase understanding of the concept of alignment for climate-resilient development at the country level. The brief targets country-level teams engaged in planning and implementation of the different policy processes, as well as international actors supporting climate-resilient development efforts. It approaches the issue from the perspective of actors working to advance climate change adaptation and its integration in development processes, toward reduced vulnerability to climate change and strengthened resilience. It provides a definition of alignment and presents the rationale for aligning these particular policy processes, as well as a continuum of approaches to alignment. This is the first in a series of briefs on the topic, providing the conceptual basis for engaging governments and other stakeholders in dialogue on how to take alignment forward. *Download the brief from the right-hand column. See the brief for relevant references. In this brief, alignment is defined as a process of identifying synergies among policy processes with common objectives to increase coherence, efficiency and effectiveness for improved outcomes. Coherence, by facilitating analysis of shared objectives, co-benefits and tradeoffs between differing objectives, leading to more strategic investments and ensuring that efforts in one area do not undermine progress in another. Efficiency, by avoiding duplication of efforts and enabling smart use of resources, including finance and human resources. Effectiveness, by approaching climate-resilient development in an integrated way, leading to improved quality of planning, implementation, and measurement and evaluation processes for better results. The process of alignment necessitates intentional coordination among government actors across ministries and levels. Alignment demands flexibility, both to enable coordination and to ensure integration of new information and learning over time. It should therefore be accompanied by continuous review and monitoring. It is important to note that while alignment and mainstreaming are related to each other they differ in their objectives. Alignment of country-level policy processes under the 2030 Agenda for Sustainable Development, the Paris Agreement and the Sendai Framework for Disaster Risk Reduction can help to advance climate-resilient development. Alignment can increase coherence, efficiency and effectiveness in country policy processes for improved outcomes. At the global level, these agendas share objectives to strengthen resilience, build adaptive capacity and reduce vulnerability to climate change and disasters, creating a strong rationale for alignment. The approach to alignment will differ depending on the particular country context. Progress on alignment may follow a continuum from informal to systematic.